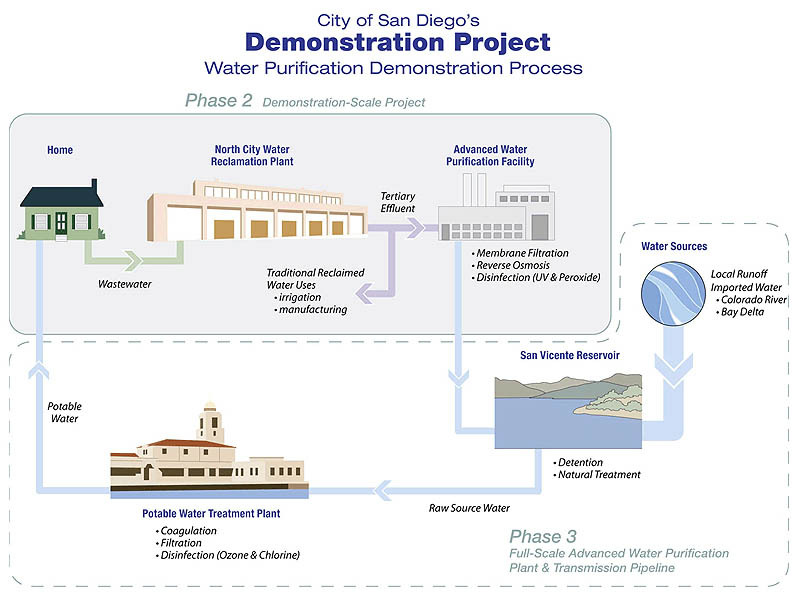 The City of San Diego is studying the feasibility of using purified recycled water to bolster its reservoir supply through its Water Purification Demonstration Project (originally called the Indirect Potable Reuse Reservoir Augmentation Demonstration Project). Potable reuse has been a controversial and emotional topic in San Diego’s quest for new water resources. Provocative stands by certain politicians and pejorative headlines in some news media obscure a key underlying fact: for San Diego the real issue is unplanned vs. planned indirect potable reuse. San Diego imports about 80% of its water from Northern California and the Colorado River. Imported water from these sources contains treated wastewater from over 345 municipal wastewater facilities — and when we get it, it only gets standard water treatment before delivery to customers. This is called unplanned indirect potable reuse. We’ve been doing it all along. By contrast, under San Diego’s planned indirect potable reuse proposal, recycled water (aka treated wastewater) would subsequently go through a multi-staged advanced purification process rendering it similar in quality to distilled water. The purified water would be blended with our imported raw water in the San Vicente Reservoir. So, in fact we would actually improve the overall quality of the imported water before it goes to the final water treatment plant. The stated goal, if the demonstration project is successful, is to produce 16 million gallons per day via the potable reuse process. If that amount of production can be achieved, that’s 16 million gallons per day less in imported water purchases, and 16 million gallons per day less in wastewater discharge into the ocean. The Demonstration Project is also performing a limnology study to determine the reservoir mixing and dilution dynamics associated with adding the purified recycled water. Over the last year the City of San Diego has been conducting educational presentations and guided tours of the advanced purification facility. The Water Reliability Coalition, a broad-based coalition of community organizations and groups has formed to further educate the public about potable reuse in San Diego. Polls indicate growing public acceptance of the process. Immediately below are the latest news reports on the project. Below that is a selected bibliography on potable reuse and related topics, which will be updated as new information becomes available. Jul 14, 2010: Monthly IPR project update July 2010 / Public Utilities Dept. Jun 13, 2010: Monthly IPR project update June 2010 / Public Utilities Dept. May 3, 2010: Monthly IPR project update May 2010 / Public Utilities Dept. Apr 14, 2010: Monthly IPR project update Apr 2010 / Public Utilities Dept. Mar 17, 2010: Monthly IPR project update Mar 2010 / Public Utilities Dept. Feb 9, 2010: Monthly IPR project update Feb 2010 / Public Utilities Dept. Recycled water pricing study draft report 2009 / San Diego Water Dept.